Vienna (in German: Wien) is one of the most beautiful cities in Europe and provides highest quality of living. For many centuries it has been the capital of the Austrian-Hungarian empire giving us magnificent buildings like the Hofburg and the Schönbrunn and Belvedere palaces. 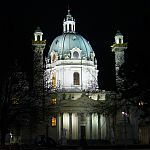 Today, Vienna is the capital as well as cultural and economic center of the Republic of Austria and hosts major international organizations such as the United Nations, OPEC, and OSCE. Vienna is still regarded as the musical capital of Europe or even the whole world. It offers exciting concerts, operas and musicals, as well as impressive exhibitions. Enjoy the delights of Viennese cuisine, typical Viennese "gemütlichkeit" at cafés and Heurigen, or the green side of Vienna in the city's many parks. See Vienna's official tourist information website for more information. PPPJ 2010 will be held at the Vienna University of Technology, which is located in Vienna's 4th district, close to the city center. The conference takes place at Prechtlsaal (pdf), on the ground floor of the University's main building, Karlsplatz 13. The room is equipped with a video beamer, overhead slide projector, and a flip chart. 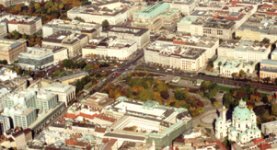 An interactive map of Vienna is available at Vienna city map. The conference venue is covered by a wireless local area network providing free Internet access. Network and user account information will be provided at the registration desk. We have made room reservations at four different hotels between September 15 and 17. All hotels are within walking distance to the conference venue. Buffet breakfast is included in the price at every hotel. All rates shown are per room and night. Please book directly at these hotels and mention "PPPJ 2010" during booking. If no more rooms are available, please try a search at http://www.info.wien.at/. The map below shows the locations of the hotels, identified by the letters given above, and the conference venue, identified by the red marker with the dot. The "U" icons mark the two nearest underground stations. All hotels are within walking distance to the conference venue. The distance from Hotel Carlton Opera (A) to the conference is about 700 meters (about eight minutes to walk). There are five underground lines and more than 100 tram and bus lines. The PPPJ location is conveniently close to the underground stations Karlsplatz (U1, U2, and U4) giving fast connections to most places. A single ticket is valid for travelling one way in one zone, where the whole city is a single zone. You can change to different lines in the course, but you must not interrupt your journey. Single tickets can be purchased at a price of 1.80 Euro at ticket machines in underground stations or at points of advance sale. Tobacconists also sell tickets. Usually there are no ticket machines at tram and bus stops. You can purchase tickets on board of busses and trams at an increased rate of two Euro. Tickets must be validated at the begin of a journey. To validate your ticket stamp the ticket at the blue machines located at the entrance of underground stations as well as on buses and trams. Tickets bought directly from the tram or bus driver (and some tickets from ticket machines in underground stations) are automatically validated and need not be stamped. Apart from single tickets there are passes for longer periods of time. Passes are available for 24 hours and 72 hours (beginning at the time when stamped), or as weekly, monthly or annual passes. The Vienna International Airport (VIE) in Schwechat is about 20 km away in the south-east of Vienna. Train lines S7 and S2 connect the city center with the airport. You need a single ticket for two zones (3.60 Euro) between the airport and any place in the city. To go from the airport to the PPPJ location you may change at Landstraße/Wien Mitte to U4 (direction Hütteldorf) until Karlsplatz. The City Airport Train (CAT) is a more comfortable line connecting the airport with Wien Mitte (8 to 10 Euro one way). Furthermore, there are bus services to and from several places in the city. A taxi fare is at around 40 Euro. At the PPPJ location (and everywhere around the city center) long-term parking is difficult. The entire area is a short-term parking zone from Monday to Friday 9am till 10pm. You must fill in a prepaid parking voucher (Parkschein) for a maximum duration of 1.5 hours. On weekends and during the night parking is free in many streets. There are convenient Park & Ride facilities in the outer districts of Vienna.